We are engaged in manufacturing and supplying wide assortment of MIG Welding Machine that is used for pipes and sheet metal components. Fabricated with perfection, these welding machines are available in various sizes and dimensions & can also be customized on client's defined specifications. Due to offered features, these machines are highly appreciated by clients all across the globe. 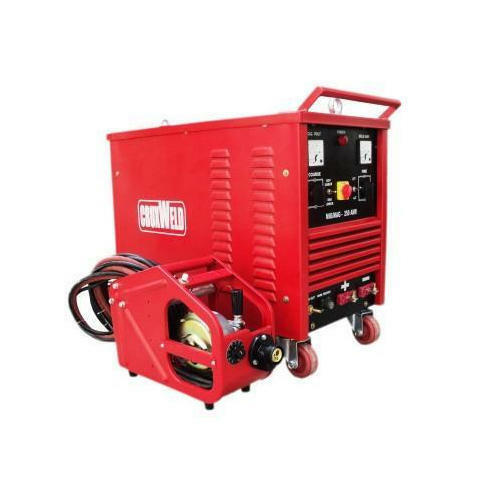 Cruxweld MIG Series Power Source is real Work Horse with high MTBF. Excellent arc characteristics over the entire current range. Constant voltage rectifier type power source suitable for dip and spray transfer welding. Light weight wire feeder with quick release mechanism to minimize welder fatigue. Power source specially designed for short arc with wire sizes from 0.8 mm, 1.2 mm, 1.6 mm and 2.4 mm. Forced air-cooling for enhanced unit life. Standard one year warranty on machine and Two years on the coil and core unit. Excellent quality with Solid/Flux Cored/SS/Aluminium Wire. Specially designed to work in Indian extreme environment and terrain work conditions.